It was a beautiful day; the weather was perfect for this outdoor event organized by RadioBDC. We all met at the World Trade Center Dock and boarded the Provincetown II, a large harbor cruise boat, to begin the adventure. The ride to Thompson Island was thoroughly enjoyable, no Dramamine was needed. The waters were smooth and the bars were stocked. Everyone was in a good mood, hanging out with friends and also making new ones. The boat ride didn’t take long and we soon arrived at the island. I didn’t know what to expect when we got there and was really surprised after the short walk from the dock when we reached a wide-open field that was well-stocked for a party. There were long tables filled with plenty of free food for everyone. There were two tents: one with tables and chairs for eating and the other setup with a sound system for the bands. There was a bar in each tent filled with drinks, including plenty of Saporro beer + Malibu drinks so no one was left out. The concert was a real intimate one, held inside one of the tents, no stage and no barriers. People circled the musicians, standing on all sides, getting as close to the performers as they wanted. The band, Parks, opened the show. They had a fun sound and engaged the audience smoothly like we had all been friends for years. They describe themselves as a garage-pop band. They reminded me a little of The Shins sound. The audience liked them, clapping after every song. 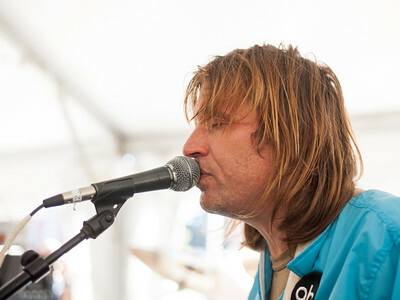 When The Lemonheads came up, the circle of people tightened, closing in on the band. These guys didn’t seem to mind though, their songs soon came pouring out. This band has been around since the 80’s, coming from Boston and remaining a favorite for years. The played a full set, almost 20 songs, including the singles that everyone knows and loves, “It’s a Shame About Ray” and “Into Your Arms.” Evan Dando sang every song full of emotion, pouring his heart out. After the bands had finished, people left the tents to enjoy the sunny day on the island. Some walked around exploring, others played at the volleyball net setup on the field, some others played with the Frisbee and beach balls that were around, while plenty more lounged on the Adirondack chairs that were scattered about. It was like a scene out of a John Hughes movie; Adam12, RadioBDC DJ, kept the tunes going and everyone had a good time. The end of the day seemed to come too soon though. We all boarded the beautiful Samuel Clemens, a replica steamboat, to go back home. RadioBDC outdid themselves with this one, everything was perfect and I can’t wait for the next event!